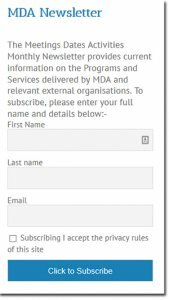 The MDA produces a regular magazine Messenger filled with the latest information MD, Research programs, Activities and Events. Messenger is mailed to more than 9,000 people with a readership exceeding 25,000. In receipt of the Messenger are the following; members of the MD Community, Donors, Sponsors, Supporters, State and Federal MPs, small to large business, the corporate sector and those in the community providing support to the MD Community. 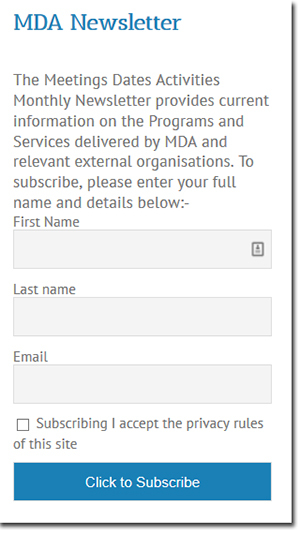 To register for receipt of Messenger via email, go to the Home Page and enter your details in the form depicted below. This is located on the bottom right hand side of the Home Page.